In the last chapter, we split the views of our app into separate components, which was a big step forward towards a nice, scalable architecture. We also briefly touched on navigation using a PageControl, which worked fine as a first step towards hooking our pages back together in a meaningful way. While PageControl works great when you have a couple views that you want presented "side-by-side" with the ability to swipe between them, it's not quite perfect for our use case. For example, our EditHikePage isn't very useful until it actually has a hike to edit, so it doesn't make sense to simply swipe to that view. 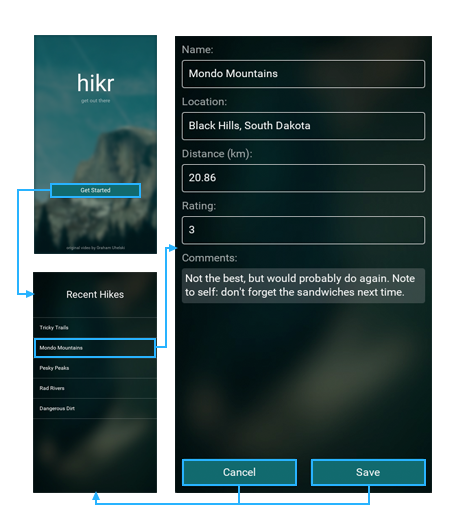 Instead, we'd like to navigate to that view once we've selected one of the available hikes to edit in our HomePage, and it'd be even better if we didn't have to keep the EditHikePage around until we needed it. Similar to a PageControl, a Navigator is a navigation container. This is a fancy way of saying it's a control that can contain components (usually Pages) that we can navigate to. However, unlike a PageControl, a Navigator uses templates to instantiate its child components on-demand. This allows a Navigator to instantiate and recycle pages as needed, conserving precious system resources. Also, Navigator doesn't support swiping between its pages by default like PageControl, but that's because it can express richer relationships between its children. It is of course possible to add swiping behavior to pages in a Navigator for the cases where that's needed. By convention, we name the templates the same as the class names when used in a navigation context. Why, will become apparent in the next section. Basically, what each of these attributes says is that for a given key (HomePage and EditHikePage in this case), we want the Navigator to instantiate the associated class. So, if the Navigator is asked to navigate to HomePage, it will instantiate a HomePage instance (if it hasn't already) and navigate there. Similarly, when asked to navigate to EditHikePage, it will instantiate an EditHikePage instance (if it hasn't already) and navigate to that instead. We can add any amount of templates we want, given that each of the keys is unique (if they weren't, the Navigator wouldn't know which template to use for a given key). Now, if we save this, our previews will update, but our pages will disappear! This makes sense, because we've only specified which templates our Navigator will use to create its child components, but we haven't asked it to actually instantiate anything yet. Typically, we'll do this by navigating to a specific route, as we'll see in the next section. However, Navigator also supports specifying a default path that will be used to create a default child if we haven't navigated to one of its children yet. This is a common case that's perfect for our use case, as we'll want our Navigator to display our HomePage first, and then navigate to the EditHikePage once we've selected a hike to edit. Now, when we save this, our HomePage will be displayed like we expect. Cool! Note that we can also change the DefaultPath to EditHikePage to show our EditHikePage if we'd like. Feel free to try it! We usually model simple navigation like the one we need here using an stack of pages. Whichever is the top most page on the stack is the page that is currently active. Using a stack like this, we can easily push and pop pages onto the stack, and automatically get a navigation history that we can navigate back through. We should now see our HomePage in the preview window, but you'll notice that it is no longer possible to swipe to navigate to EditHikePage. What we'll do instead is to navigate to EditHikePage whenever the user clicks one of the buttons in HomePage. If you hit save, you should now notice that we are indeed navigating to EditHikePage when we click one of the buttons in HomePage. Pretty easy, right? While we're at it, lets rename our chooseHike method to something that's more descriptive of its current function, like goToHike. Make sure you also update the binding in HomePage.ux. And that's all it takes! We now have a proper navigation up and running, and even separate page models which we can use to separate the business logic for each page. Our entire app model currently resides in App.js. Having all our data here is fine for now, but we at least want to move the view specific code, like which hike has been selected, in the page that cares about this information (which in this case is EditHikePage). Make sure you also remove the this.hike field from our App class' constructor. And at this point we're all done. Whatever we want EditHikePage to do with the current hike can now be handled by the EditHikePage class. Our components are working together, which is awesome! In the next chapter, we'll work on mocking up a backend. This will help us nail down the architecture of our app to make it easier to add a real backend at some point in the future. So let's dig in!